Today in the 'rock room' spins the first LP in what is regarded as David Bowie's 'Berlin Trilogy'. The album Low was released in 1977 to mixed reviews and per usual what started out as a misunderstood record has grown in stature and gained respect in the intervening years. The record is a collaboration with producer Brian Eno and contains some of Bowie's most challenging and provoking work. Recorded in France and West Berlin in the midst of Bowie's cocaine addition, the record is a conglomerate of sound experimentation, emotional turmoil and Bowie's artistic escapades. 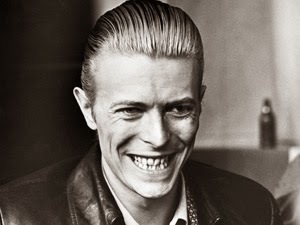 Always the musical changeling, Bowie developed and arranged Low into a diverse musical piece comprised of what some critics referred to as musical fragments, as well as extended ambient instrumentals. 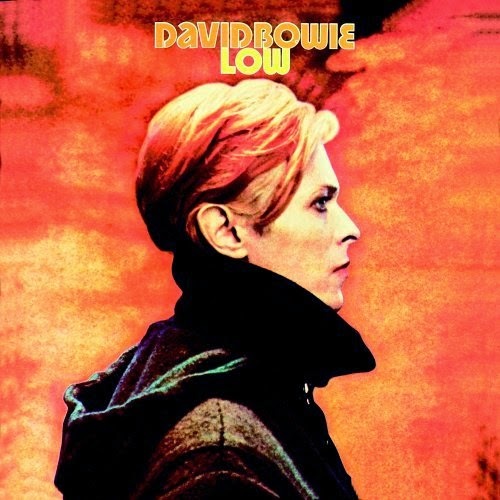 Influenced by electronic music as well as experimental and German electro-dance music, Low is a typically expansive Bowie excursion that travels through the silvery wreckage of addiction, artistic experimentation, self discovery and melody. 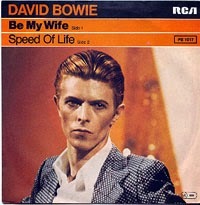 The LP opens on the instrumental 'Speed of Life' which acts as a racing prologue to the collection. Streaking cartoon like motion lines disperse off the shimmering ARP synths and Moog interjections. The song elicits an animated travelogue through futuristic time villages, soaring on Alomar's twisted central guitar riff. 'Breaking Glass' follows, driving in on a massive splash of snare drum, each hit a reverberating shattering smash. The song flies by like a car landscape passing outside a freeway window, the propulsive slippery guitars and full warm bass working in bright conjunction. Bowie's vocals during the one recitation of a chorus, multilayered and towering, otherworldly and synthetic. This track cuts deep, jagged, sharp, fast. 'What In the World' continues side one, again beginning on large splashing harsh drums. The melody of the song is quintessentially Bowie, the backing track a multifarious display of scrubbed bubbly guitar, Iggy Pop's backing vocals, and teletype synthesizer additions. The drum sound of the LP was revolutionary at the time, to be copied and used in the future by numerous electronic and rock producers. The content of the song is dealing with a mysterious female subject who not only frightens the narrator, but elicits lust from him also. 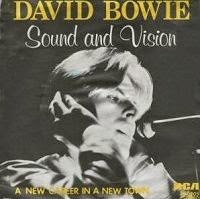 'Sound and Vision' was one of the singles off of the record Low, subject to an extended introduction and delicious funk based guitar riff. The song contains a minimalist and slightly dark approach lyrically, contrasting with the levitating and airy instrumentation. The rhythm is developed around a breathy percussive release of air pushing away the snare drum, Bowie's vocal approach is also a smiling sigh. Bowie seems to be revealing the moment of corroboration between he and his muse. Drifting in his solitude, 'waiting for the gift of sound and vision' to approach him. Probably the most 'conventional' song on the record, the song contains a delicious Bowie vocal melody and buoyantly addictive riff. 'Always Crashing In the Same Car', plays like an psychedelic, sizzling wires crossed, early rock and roll vocal ballad. Lyrically the song is again minimalist, allowing the color of the music to express the flashing imagery of the words. The songs repetition of the central riff is representative of the continuous 'Groundhog's Day' effect felt by the narrator. The representation of the lyrics can be understood by everyone who has ever made the same mistake twice. One of Bowie's finest moments and a essential defining element to the makeup of the record. A perfect blend of new and unusual sound workings in conjunction with past glory and influence. The second single from the record and the closer on side one, 'Be My Wife' begins like a song played on a saloon uprigh,t located in a renegade valley on Mars. The song becomes a laser, guitars phased with tremoring lights contrasting the rich percussive thump of the woody piano. The song has a Lennon-esque approach, a lyrically pleading inquiry for a lost and lonely soul, unadorned with pretense. The multilayered vocals and guitars mesh with the plump orchestrated keyboards creating a paranoid musical wash gently percolating under the melody. Side two of the collection opens on the cold thump of a drum machine, expanding into the all encompassing warmth of ''A New Career In A New Town'. Similarly to the opening instrumental on the albums first side, 'Speed of Life,' this following song sets the stage for the second half of music with a cautious and euphoric optimism. Wining railroad harmonica acts as a rustic contrast to the voguish drums and bass personalities. The next, mostly instrumental track, 'Warszawa' is a mercurial soundscape and collaboration between Bowie and Eno. Primary built on keyboards and synths, with some cavernous vocals howls and exclamations included toward its shuttering conclusion. This is visual music bordering on the secular and a fruitful result of the Bowie and Eno collaboration. The track changes keys, reveals haunting human interludes and represents Bowie's visits to the capital city of Poland in the early 1970's. 'Art Decade' continues in the same vein, the heartbeat of a drum machine and the inner workings of a mechanical apparatus its makeup. The second side of Low acts as a assemblage of snapshots, both pastoral and industrial, expressed through only 'Sound and Vision'. The flip side of this LP creates its own world free of the confines of words and explanation, Bowie's emotional status tied to the places and locations expressed throughout the album. The songs making up side two of Low, could act as one movement, their titles act as dividers of their respective scene breaks and moods. 'Weeping Wall' features Bowie on every instrument, a pulsating synth loop provides the blood of the track. The song sounds like a ancient folk ballad reinterpreted two hundred years in the future. Layers of pensive keyboard strata elicit hope and despair as the pieces of 'Weeping Wall' fall away revealing the real human emotion at the concrete core. The closing movement of the record is the extraordinary and bizarre, 'Subterraneans'. The singular rock bottom bass guitar the only instrument keeping the song from drifting way. Fluttering illustrious keyboard swells interlace and combing like drifting clouds. The earthly appearance of saxophone is surprising in the context of the ethereal wash. The song is an odd choice to conclude the record, but a perfect fit in the context of side two of Low. Bowie's most indecipherable lyrics chant illumenscent from behind a lacy veil, visible yet slightly obscured. David Bowie's 1977 LP Low was developed from the remnants of his unused musical work for the 1976 film The Man Who Fell To Earth, as well as his collected mind journals of travels to France and Berlin; in addition to his cleaning up the broken glass of his cocaine addition. The collaboration with Brian Eno while the aforementioned factors played out on the white screen of Bowie's life combined to express an artful, erratic and yet beautiful new artistic expression. One musical LP side of verbal communication, contemporary, yet dressed in new clothes, another side verbally distorted and expressed in sonic shapes and imagined moods.